Tag line: "He's A Good Cop. On A Big Bike. 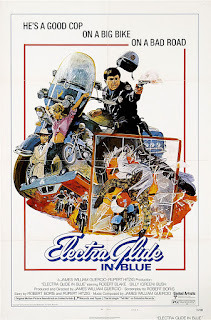 On A Bad Road"
During his introduction for the Electra Glide in Blue DVD, James William Guercio, the director of this 1973 film, tells of how he spent his childhood in a movie theater that employed several members of his family. Apparently, the owner of this particular theater was a John Ford fan, and as a result, Guercio said he saw films like The Quiet Man and The Searchers “about 200 times”. This left a lasting impression on the first-time director, and sure enough, Ford’s influence is evident early on in Electra Glide in Blue; a camera, perched in the middle of a desert road in Monument Valley, stares off into the distance. The picture is in black and white to start, then slowly changes to sepia-toned, and eventually full-blown color just as a minivan speeds past. It’s a gorgeous shot, and the picturesque panorama was captured brilliantly by the great Conrad Hall (who served as the director of photography). Along with establishing the central location, this brief scene lets us know that Electra Glide in Blue, like She Wore a Yellow Ribbon and The Searchers before it, is going to play out like a western. But while the movie’s look and feel may owe a lot to John Ford, its story has more in common with Easy Rider and Vanishing Point, both released a few years earlier (1969 and 1971, respectively). In the west that John Ford explored in films such as Wagon Master and The Man Who Shot Liberty Valance, America was still growing, and those who dared the westward expansion had a fighting chance to make a better life for themselves. In Easy Rider, Vanishing Point, and Electra Glide In Blue, however, (a trio of movies that, for want of a stronger term, I refer to as the “Motorized West Trilogy”), the main characters went looking for the American dream, only to discover it wasn’t all they imagined it would be. Motorcycle cop (and Vietnam Veteran) John Wintergreen (Robert Blake) roams the long stretches of highway that cut through the Arizona desert, dreaming of the day when he’ll be promoted to Detective. He finally gets a chance to prove himself during the investigation of an apparent suicide. The coroner (Royal Dano) insists the deceased man, a longtime resident of the area, took his own life, but Wintergreen believes he was the victim of foul play. Harve Poole (Mitchell Ryan), the detective assigned to the case, admires Wintergreen’s “go-getter” attitude, and orders an autopsy. Sure enough, the suicide was staged to cover up a murder, and all at once, Wintergreen is promoted. But as the ambitious lawman will soon learn, the life of a homicide detective isn’t as glamorous as he hoped. Robert Blake delivers an excellent performance as the proud yet naïve Wintergreen; during the opening credits, we see how seriously the character takes his job just by the way he puts his uniform on in the morning (making sure everything is just right before he walks out the door). Later, we tag along with Wintergreen as he flags down a couple of vehicles and writes them a ticket (the first is driven by an LA cop on vacation, who can’t believe a fellow officer won’t give him a break). Wintergreen’s partner in these early scenes is Zipper (Billy Green Bush), who is his opposite in every way. Zipper spends most of the day resting in the shade, and plants drugs on a young hippie they pull over (played by David J. Wolinski) simply because he didn’t like the way he looked. When he’s promoted to detective, Wintergreen is elated, in part because he can finally leave Zipper and his corrupt conduct behind him. Unfortunately, his new colleague, Harve Poole, isn’t as honest and upright as Wintergreen initially thought. Sure, Harve talks a big game, bragging about his exploits and pausing occasionally to offer Wintergreen some advice. But Wintergreen’s eyes are opened during the murder investigation when the duo, looking for a possible suspect, drive to an abandoned farm that doubles as a biker’s hangout. The bikers are less than helpful, which causes an impatient Harve to turn violent (in an attempt to show he means business, Harve beats several bikers into submission). The two detectives do obtain the desired information, but Wintergreen does not approve of Harve’s tactics, and his disappointment with his new partner grows even stronger when he and Harve have a falling out over a waitress (Jeannine Riley) that they’ve both been dating. Blake is, indeed, the star of Electra Glide in Blue, and as such he does a great job conveying his character’s early enthusiasm and eventual disenchantment. The second star, however, is undoubtedly Conrad Hall, whose camerawork, at times, gives Electra Glide in Blue an almost fantasy-like feel. While the outdoor scenes are clearly an homage to John Ford (who shot a good many films in Monument Valley), the indoor sequences are every bit as stylish, thanks in large part to the manner in which Hall utilizes shadows and back-lighting (the opening segment, a series of close-ups in which the murder/suicide plays itself out, is especially intriguing). As with Electra Glide in Blue, the remaining two movies that make up the “Motorized West Trilogy” feature the work of top-notch cinematographers; Easy Rider was shot by László Kovács (Five Easy Pieces, Paper Moon), while John A. Alonzo (Sounder, Chinatown) handled the camerawork for Vanishing Point. As a result, all three have their share of amazing imagery. 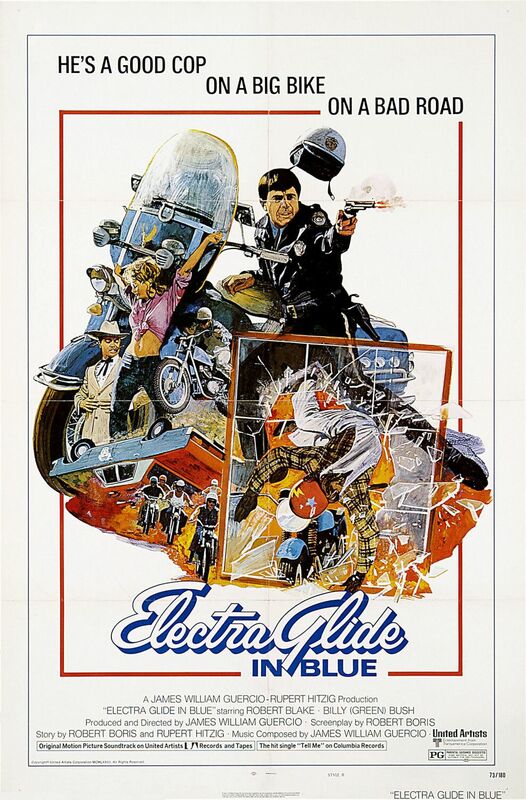 And while the protagonists themselves may be different (Easy Rider’s Wyatt and Billy are drug dealers; Kowalski in Vanishing Point is a former cop turned lawbreaker; and Electra Glide in Blue’s Wintergreen is a by-the-books policeman), the central theme explored by all three, namely their character’s disillusionment with the America they encounter on their journeys, is just as powerful today as it was during the Vietnam War era, and this particular aspect of their stories is what will stay with you long after the movies have ended. One of my brothers has loved this movie since it came out. He sang its praises to me for years. I still haven't seen it.